Jean-Luc Deglin was born in 1977 in the suburbs of Paris. After studying literature, he settled in the south of France and started as a self-taught artist. He began working in newspaper comics while also assisting friends with colors and layouts. 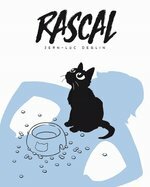 Rascal, originally serialized as Crapule in the Franco-Belgian magazine Spirou, is his first book.